Dollar Tree Stores are recalling projector flashlights after reports of batteries and bulbs overheating, posing burn and fire hazards. 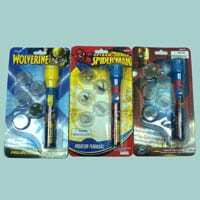 The flashlights have Wolverine, Spider-Man and Iron Man 2 Flashlights characters printed on them and come with discs that attach to project images. The back of the packaging contains the number 16879-20012-003-1003 and UPC 6 39277 16879 5. The products were imported by Greenbrier International and sold at Dollar Tree, Dollar Bill$, Dollar Tree $1 Stop, Deal$ and Dollar Tree Deal$ stores nationwide from August 2010 for about $1. Consumers should take the recalled flashlights away from children immediately, remove the batteries and return the flashlights to the store where purchased for a full refund. For additional information, contact Dollar Tree Stores Inc. at (800) 876-8077 or visit http://www.dollartree.com.